Traditionally, non-profit websites have included a list of highlights or significant dates in the organization’s history. And that’s a great idea. Showcasing your non-profit’s past helps to establish its stability, to build trust, and to communicate the general development of the organization and its mission. But let’s face it, those “Our History” pages can be deadly dull! 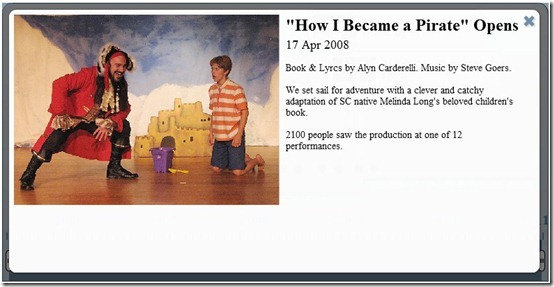 Inspired by 7 Eye-popping Interactive Timelines (and 3 ways to create one) at 10000Words.net, the Columbia Children's Theatre in South Carolina did just that. 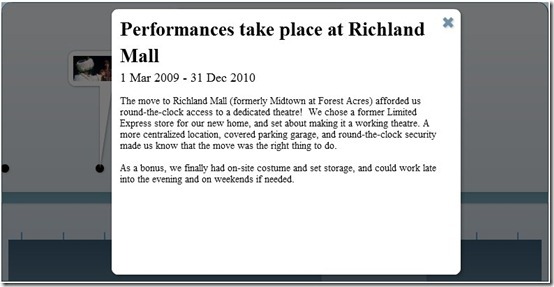 As website visitors move their mouse cursor across the page, little “speech bubbles” appear for each black dot on the timeline – each one with a date, a photograph, and the title of the show that opened on that date. Click on any of those bubbles for a larger photograph (look, a pirate!) and more details about the event. Using this timeline will be very intuitive for most, but for your less savvy website visitors there’s a plus sign (+) in the upper right of each bubble to give the hint that there’s more to be seen. See the sliders at the very bottom of the timeline? Dragging those with the mouse lets the viewer zoom in on a specific period of time. That means you can enter a great many events or other dates of note into a short timeframe and it will still all be readily accessible – not a big mishmash of overlapping items. 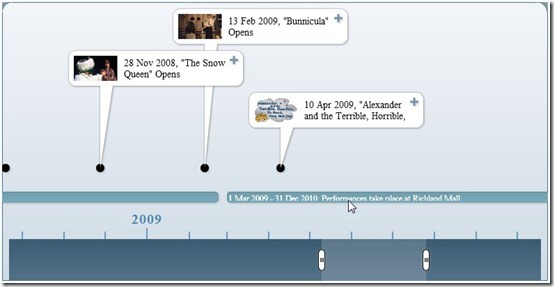 Could Your Non-Profit Use an Interactive Timeline? 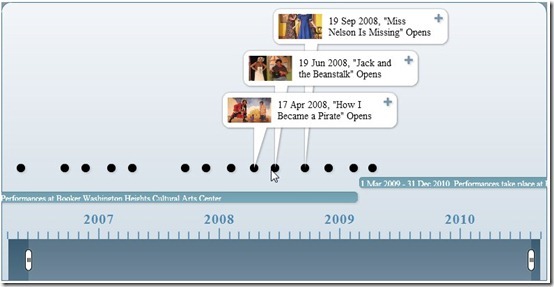 A free online tool called TimeToast was used to create the Columbia Children’s Theatre timeline, which was then embedded in a page on the organization’s website. So far, TimeToast is the best-looking and most user-friendly tool I’ve come across – but it is certainly not the only choice you’ve got. What else should be on this list? If you’ve discovered a cool tool to create an interactive timeline, please tell us about it in the comments! I tried out Timetoast to make a history of my org - Mano a Mano, and was impressed. Very easy to use, and free! For another TimeToast example to look at, here's Nate's timeline http://manoamano.org/articles/2010/09/16/mano-a-mano-timeline (or http://www.timetoast.com/timelines/73292) of Mano a Mano's work with impoverished communities in Bolivia. Ephraim, I'll look forward to seeing what you come up with for a timeline for Machshava Tova!